In April, about halfway through the month, the thunderstorms of March are beginning to subside, and the wind picks up. Seeds are being blown about on the breezes, spreading life all around from one place to the next. In fact, this lunar cycle is often known as the Seed Moon. Trees have buds on them, spring daffodils and tulips abound, and the birds are nesting once more. Much like March, this is a time of conception and fertility and new growth. Bright primary colors such as red, yellow, and blue–and their many combinations–are associated with the ongoing spring season. Gemstones like quartz, selenite, and angelite are connected to the element of air. Leave stones outside on a windy day to absorb the energy of the elements. Trees, including hazel, forsythia, lilac, and willow, are beginning to bud in April, and represent the beginnings of new life for the coming summer. Gods and goddesses like Ishtar, Tawaret, Venus, Herne, and Cernunnos all represent the greening of the earth, and the coming of the fertility season, which is right around the corner. Herbs like dandelion, milkweed, dogwood, fennel, and dill are associated with air, in part because their seed pods will blow away and spread on a breezy day. The element of air is strongly tied to this month, because of the winds that may pop up out of nowhere to surprise you. This is a good time to work on magic related to new beginnings. Looking to bring new love into your life, or conceive or adopt a child? This is the time to do those workings. It's the time to stop planning, and start doing. Take all those ideas you've had brewing for the past couple of months, and make them come to fruition. April does tend to be a wet, soggy month in many areas, so now is a good time to gather up rainwater for use in magic and spellwork. Leave a few glass jars outside in the open so you can collect water for different magical purposes. For instance, rain that accumulates during a soft, light drizzle can be used in rituals for calming and meditation. On the other hand, the water that fills your jar in the middle of a late-night, thunder-and-lightning deluge is going to have a lot of energy in it–use this for workings related to power, control, and assertiveness. 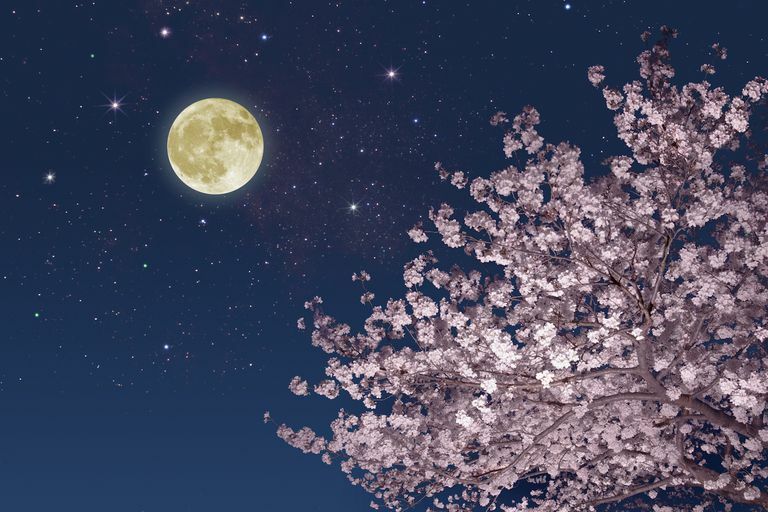 Don't forget, this month's full moon is also called the Seed Moon. Do some planting magic, plan out your garden, and get your seedlings started. In the weeks leading up to Beltane, do this planting ritual to get new things growing in your garden and in your life as a whole. The very act of planting, of beginning new life from seed, is a ritual and a magical act in itself. To cultivate something in the black soil, see it sprout and then bloom, is to watch a magical working unfold before our very eyes. The plant cycle is intrinsically tied to so many earth-based belief systems that it should come as no surprise that the garden is a magical place in the spring. Because April's moon is associated with the winds–for obvious reasons–now is a good time to explore the winds that blow from each of the cardinal directions. For instance, the North Wind is associated with cold, destruction, and change–and not always the good kind of change. If you've got some bad stuff looming on the horizon, now's the time to work through it. Do this not just by changing yourself, but also the way you respond to other people and to events that are taking place in your life. The South Wind, in contrast, is connected to warmth and the element of fire, which in turn is associated with passion and power. Fire is a destroyer, but it also creates, so if there is a passion that you've lost in your life–whether it's romantic or something else–work on doing what you need to do to rebuild it. The winds of the East are often associated with new beginnings; in particular, focus on new careers, education, or other aspects of your life that are related to communication and your intellect. Finally, the West Wind is tied to the cleansing and healing powers of water, so if you need to get rid of things that are causing you heartache or pain, let the wind blow them right out of your life.